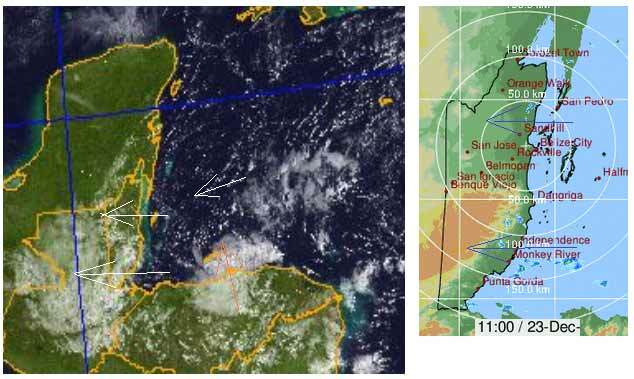 Belize NMS: A light to moderate and somewhat moist east to northeasterly airflow prevails over the area. 24-hour forecast: Sunny with a few cloudy spells today and cloudy at times tonight. Showers will continue to be isolated, except for slightly more over the south. General Outlook: (Sun. and Sun. night) A few cloudy spells, along with a few showers, mostly over the south and coast. Today E-NE 10-20 kts Choppy-Moderate 3-5 ft ISOLATED SHOWERS, FEW MORE SOUTH. Tonight E-NE 10-20 kts Choppy-Moderate 3-5 ft ISOLATED SHOWERS, FEW MORE SOUTH AND ALONG SOME COASTAL AREAS. Tomorrow E-NE 10-20 kts Choppy 3-4 ft A FEW SHOWERS MAINLY ALONG THE COAST. Outlook NE 10-20 kts Choppy 3-4 ft A FEW SHOWERS, MOSTLY OVER SOUTH AND COAST. 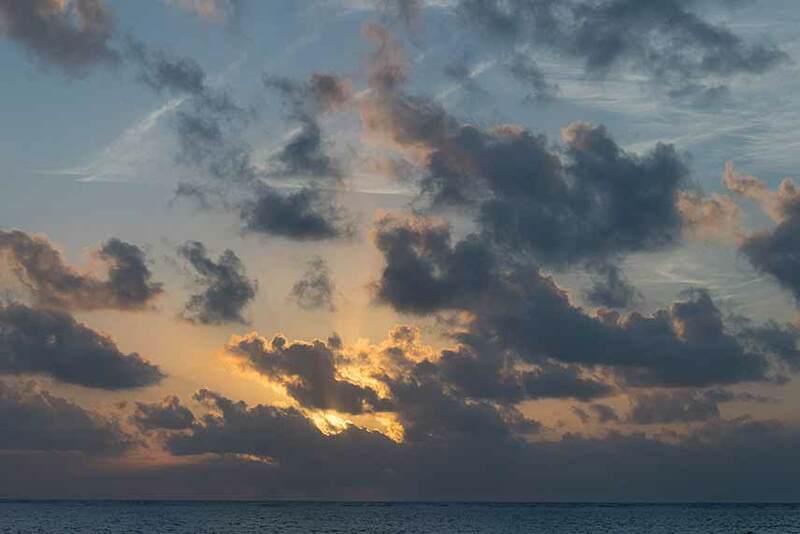 On Ambergris Caye this morning the wind is from the East-NE at 15mph. and the sea is choppy. 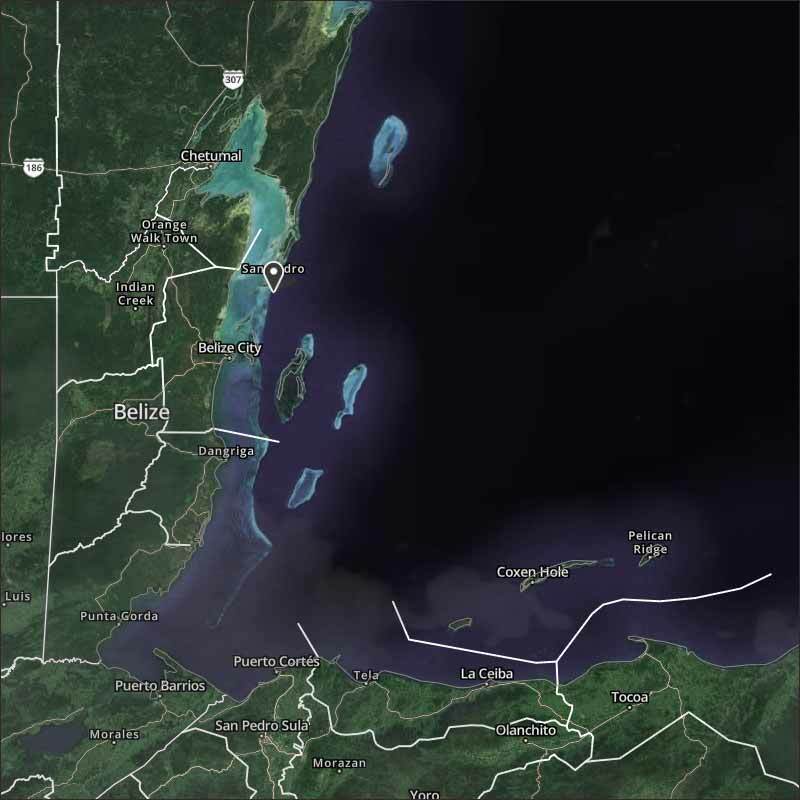 Our expected high for the day is 84 f.
The easterly Caribbean winds continue with patches of cloud, riding over the surface cloud or fog that presently covers much of Belize. There are also areas of southerly higher cloud adding to the cloud cover, including more coming off Honduras that may effect our weather later today. But the Caribbean winds are already producing cloud as they cross over the sea/land border. The regular NOAA satellite picture is not available this morning. Looks like today is going to be a bit more cloudy than yesterday and with a few more rain showers from time to time.